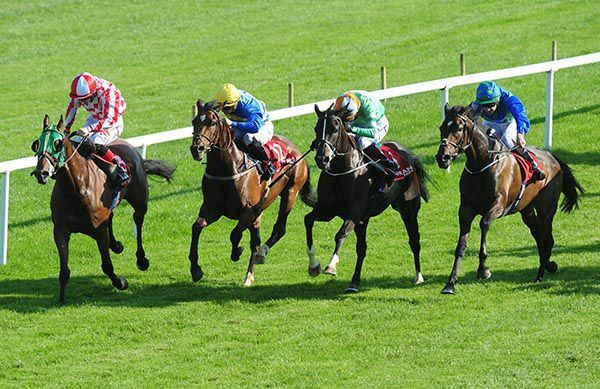 Donnacha and Joseph O'Brien teamed up for a treble at Gowran Park tonight when Rockfish claimed the nine-furlong handicap. The 5/2 favourite was produced to challenge front-runner Just Sherry on the outer a furlong-and-a-half from home. He got on top inside the final furlong to record a hard-fought half-length win over that rival. The winner was following up his success at Cork 11 days ago and was recording his third career victory having also scored at Dundalk last month. “He got 9lb the last day but he's competitive in that grade,” said Joseph O'Brien. “He's a grand horse and he's after winning his few races. Any horse that wins three races is good. 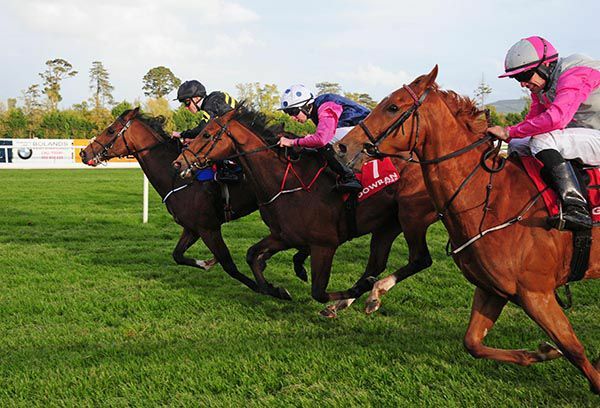 Pedisnap made it a double on the card for Joseph and Donnacha O'Brien when running out a game winner of the second division of the seven-furlong handicap at Gowran. The Footstepsinthesand filly had to overcome traffic problems a furlong from home but ran on well in the closing stages to get her head in front near the finish. She had three-parts-of-a-length to spare with a bunch finish behind her. Althib took the runner-up spot with A Likely Story and Cracking Name dead-heating for third. 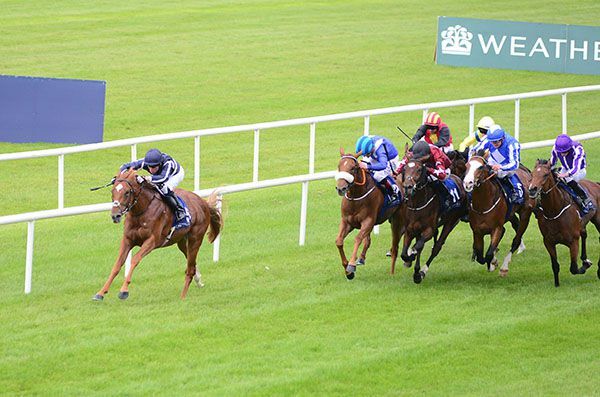 The 4/1 winner had been third on her first outing for O'Brien at Killarney a fortnight ago. “She had a nice run the last day and I thought she'd come forward and that'd she go fairly close so it's nice she won,” said the winning trainer. “I won on her mum in Wexford one day. That's her second run for us so it's grand and she'll go for another 65 somewhere. A drop back in trip proved the key for Rapture's Delight as he opened his account at the third time of asking in the opening seven furlong maiden at Gowran Park. 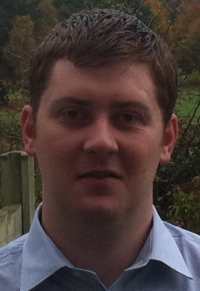 The Joseph O'Brien-trained colt was produced to challenge over a furlong from home by the trainer's brother Donnacha. The 9/4 shot wore down Take A Nap inside the final furlong, getting on top close home for a neck victory. 8/13 favourite Mayaadeen was two-and-a-half lengths back in third. 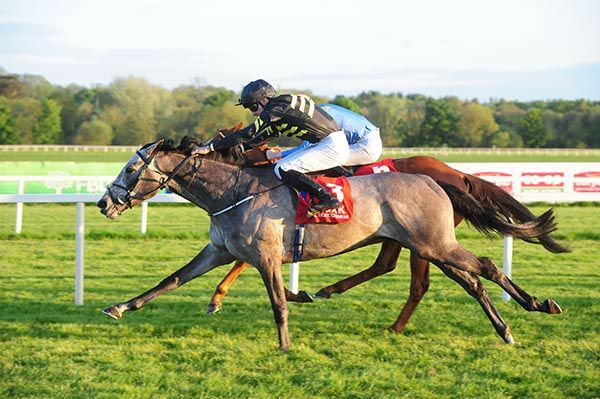 Rapture's Delight was runner-up at Dundalk early this month before finishing fourth at Navan last time. “He had a lovely run the first time. 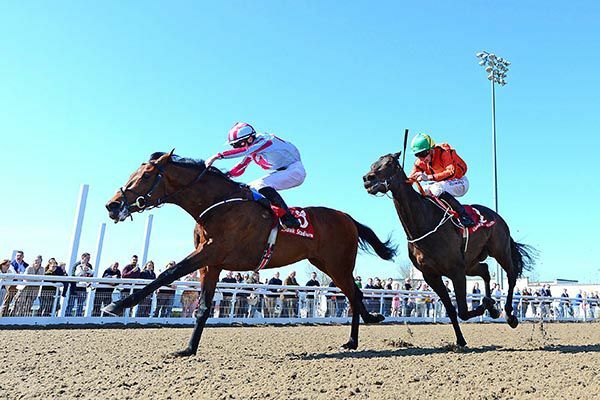 Then we went a mile-and-a-quarter in Navan and it was the wrong thing as he was too keen so we dropped back to seven today,” said the winning trainer. “He'll probably step into a handicap now. He likes a bit of nice ground but he's by Invincible Spirit so he might handle it a bit easier too. “He hasn't had a chance to run on easier ground but I'd be hopeful he'd handle that as well. Joseph O'Brien has two possible runners in Escamillo and Latrobe in the Prix Du Jockey Club at Chantilly on Sunday. 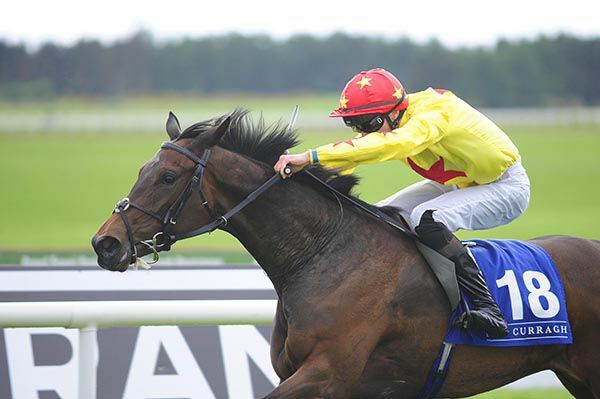 On This Day 2009 Joseph O'Brien the 16-year-old-son of trainer Aidan and Anne-Marie rode his first winner in the Kilmacud Handicap at Leopardstown. Medal Of Honour came from last to first to win the concluding mile handicap at the Curragh in the hands of Seamie Heffernan. He gave the jockey a double as Heffernan also won the Marble Hill on Fairyland. You certainly couldn't call him a winner at halfway in this mile contest, however, he made eye-catching headway on the outer to charge into contention at the two pole. He soon collared Raphael and kept on strongly to win by a length and three quarters at 16/1. Bond Street, the 3/1 favourite, kept on for second once in the clear. He was a head in front of Dance Emperor (10/1 from 14s). Trainer Joseph O'Brien said: “We thought a lot of him last year and he ran very well in a few good maidens but his form kind of levelled off then. It's nice to see him come back and do that this year. Seamus was very happy with him. “He bumped into a couple of serious horses like The Pentagon and Rostropovich. 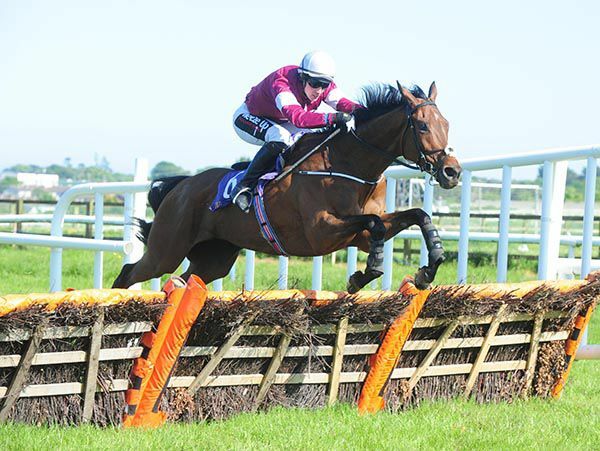 Gigginstown House Stud were responsible for a 1-3 in the opening Welcome To Wexford Racecourse Maiden Hurdle, for unplaced horses, at Wexford today, as the Joseph O'Brien trained Cut Em Down won under jockey J.J. Slevin. The race was confined to horses which have run at least three times but have failed to place, and in the end was won in comprehensive style by Cur Em Down, who beat Pallaskenry by six lengths with a further 17 lengths to Gigginstown's other runner Cote Tete. Afterwards jockey Slevin, a cousin of winning trainer O'Brien, said “he had an alright run in a bumper over the winter, and obviously the good ground has helped him today, and he has won very easily. “Joseph said to make plenty of use of him, give him a bit of light and to get him jumping. It's onward and upwards for him now hopefully. "They have done a good job watering here, but it is genuine good ground." After taking the sixth with Rockfish, Joseph and Donnacha O'Brien doubled-up with newcomer Dynabee in the concluding Irish Stallion Farms EBF Median Auction Fillies Maiden. Having opened at 10/1 on-course, this Calumet Farm owned three-year-old eventually went off at 8s. Seventh three furlongs out, the daughter of English Channel was then switched to the outer and came with her challenge over a furlong out. She soon gained a marginal lead, and kept on well inside the final furlong to just get the better of fellow newcomer Mazzuri by a short head. The runner-up was returned at 12/1 under Billy Lee for Willie McCreery, while 7/2 chance City Ballerina was another two and a half lengths back in third. Imrana was sent off the 9/4 favourite and she finished a disappointing fifth. Joseph O’Brien said afterwards: "She is a nice filly and was a little on edge and needed minding. She has a big engine and mine don't usually win first-time like that and are usually much greener. "She even was very green so I'd say she has a big engine. "This one could be my first good horse for Calumet and she could step into an Oaks Trial now. There's a chance she's a very nice filly." 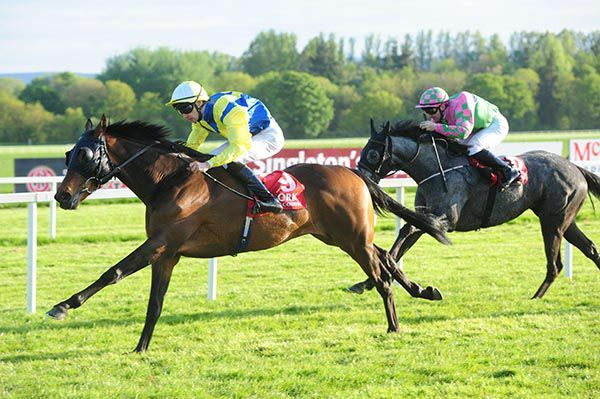 The Joseph O'Brien trained Rockfish put himself forward as a possible contender for juvenile hurdling later in the summer, having gained his second career win under jockey Donnacha O'Brien in the 1m2f Summer BBQ July 13th Handicap at Cork today. Carrying the colours of bookmaker Justin Carthy, the son of Fast Company followed up a Dundalk win last month with his second success today when beating Stormy Tale by a length and a quarter. Afterwards O'Brien said "he is stepping up with each run and he won off 51 tonight and in that grade he'll be able to be competitive. A mile and a quarter is a nice trip for him and he'll go hurdling later in the year. "He ran on bad ground a few times but didn't perform on it so needs that good ground." With the form of her runner-up finish to Hand On heart boosted by the latter winning race six on this Curragh Card, Wisdom Mind was sent off favourite for the concluding fillies' maiden and duly obliged. She was backed from 9/2 in the morning but drifted out from 9/4 to 3/1 at the track. The Dark Angel filly saw out this mile well under Donnacha O'Brien to repel strong-finishing Athena (13/2 from 8/1) by half a length. Most Gifted, well supported from 5/1 to 10/3, was a length and a half further back in third. Trainer Joseph O’Brien said: “She’s a well-bred filly and ran well the last day. It’s nice to get her to win her maiden and it’s my first winner for Sun (Bloodstock). They have a few nice horses with us. “We’ll try to get some black type for her now with her pedigree. She’s a low-moving filly so I’d be hoping she might be a bit better on nicer ground. 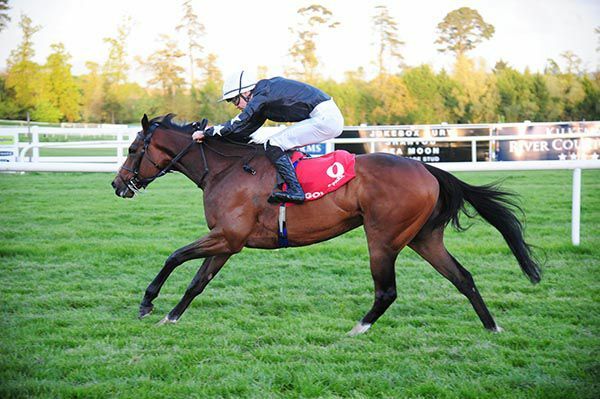 His earlier winner Irish Minister (14/1) mightn't have been expected, but Camile (7/4 favourite) sent many a punter home happy as Joseph O'Brien brought up a Gowran double with the Captain Rio mare in the concluding Goresbridge Breeze Up Sale May 24th & 25th Handicap. Shane Crosse steered Irish Minister, his 7Ib claim helping to get that Calumet Farm runner home by a short head and a nose in the median auction maiden. 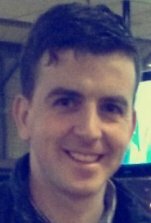 It was O'Brien's brother Donnacha that was aboard Navan scorer Camile, and she followed up that Proudstown Park win, finishing off best to beat Challow by a length and a quarter. "I thought the handicapper was a bit harsh on her after her win in Navan. She handles that ground which is a big help, and there might be another day in her in that category," stated the winning trainer. 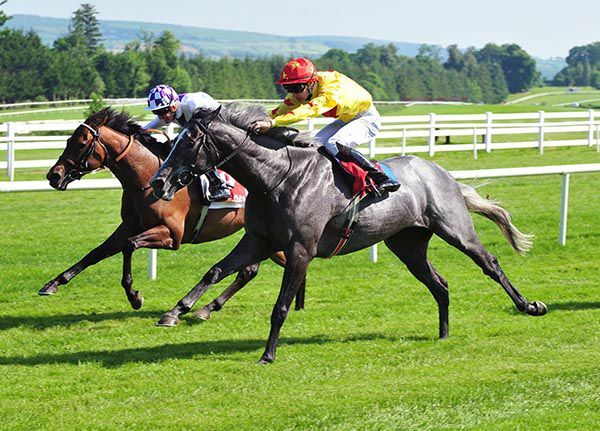 Outing number seven, his first on turf, yielded a breakthrough win for Irish Minister in the Irish Stallion Farms EBF Median Auction Maiden at Gowran. The finish of this mile contest resembled the conclusion of an ultra competitive handicap, but the margin of victory will matter little to connections and supporters of 14/1 chance Irish Minister. Shane Crosse got the Calumet Farm runner across the line in first, by a short head and a nose from Magnetic North (a 50/1 chance) and Shifted Strategy. It was only small margins back as far as the seventh then either. Joseph O'Brien trains Irish Minister said: "I was a bit worried about the ground but he'd been running consistently on the all-weather and he deserved a win. "He got a very good ride. 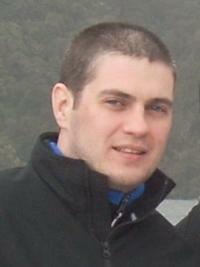 Shane is a good rider - good value for the 7Ib claim." Light Pillar made a winning Irish debut at Dundalk today as the Joseph O'Brien trained son of Galileo won the Scenic Carlingford Ferry Race under jockey Shane Crosse. The Irish bred, ex-Andre Fabre trained four year old colt was a dual winner in France and went unsold at E130,000 at Arqana Sales last September. He since joined current connections (Rafferty's Rules Syndicate) and today justified even money favouritism to beat Kerosin by a length and a quarter. The win was Crosse's third success, meaning his claim will now be reduced from 10lbs to 7lbs and afterwards the 16 year old said “he was a great ride throughout and I suppose he was the form horse going into the race. "Kevin(Manning) came through strong but when I was going to go for mine he was going to find something and thankfully he did. "I'm in school at the minute, I'm in fifth year but I'm up there (with Joseph O'Brien) when I'm off and at weekends. "Obviously the 10lbs (claim) was great. The first target was to get down from the 10lbs and now try to eat into the 7lbs as much as I can."